What you will find on this page – LATEST NEWS; NASA links (video); summers ARE getting hotter; greenhouse gases rapidly changing atmosphere; what is pre-industrial level; WMO climate status statement & report for 2016; today’s extremes, tomorrow’s normal (report); Global temperature & CO2 rise from 1850 to 2016 (interactive animation); understanding climate models (video); climate sensitivity; tipping points and temperature rise; why do CO2 levels go up and down (video); why nights are getting warmer faster than days; global average temp not same everywhere; current NOAA maps; NASA free data set; “97% scientist agree” (video); James Hansen speaks out (video); Two degree “safe limit”; climate system lag time; trends or steps?? 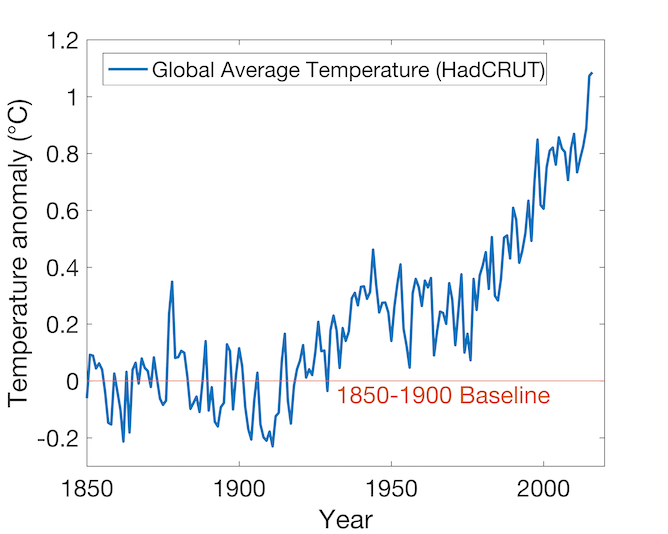 NASA Global temperature change. Why should we care about one degree of warming? CLICK ON IMAGE TO ACCESS INTERACTIVE MAP: This color-coded map shows a progression of changing global surface temperatures from 1884 to 2016. Dark blue indicates areas cooler than average. Dark red indicates areas warmer than average. What does pre-industrial levels mean? 14 November 2016: 2016 is set to break even the temperature records of 2015. It is very likely that 2016 will be the hottest year on record, with global temperatures even higher than the record-breaking temperatures in 2015. Preliminary data shows that 2016’s global temperatures are approximately 1.2° Celsius above pre-industrial levels, according to an assessment by the World Meteorological Organization (WMO). Global temperatures for January to September 2016 have been about 0.88° Celsius (1.58°F) above the average (14°C) for the 1961-1990 reference period, which is used by WMO as a baseline. Temperatures spiked in the early months of the year because of the powerful El Niño event of 2015-16. Preliminary data for October indicate that they are at a sufficiently high level for 2016 to remain on track for the title of hottest year on record. This would mean that 16 of the 17 hottest years on record have been this century (1998 was the other one). 7 November 2016, The Conversation. The recent record-breaking temperatures have often been described as the “new normal”. For example, after the new global temperature record was set in 2016, these high temperatures were described as a new normal. What is a new normal for our climate? The term has been used broadly in the media and in scientific literature to make sense of climate change. Put simply, we should get used to extremes temperatures, because our future will be extreme. 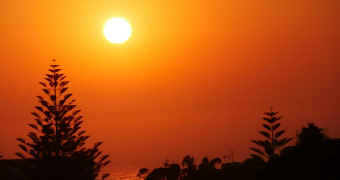 The duration, frequency and intensity of extreme heat events have increased across large parts of Australia. National science reporter Jake Sturmer picks out the key elements of the 2016 State of the Climate report. But without a precise definition, a new normal is limited and difficult to understand. If 2015 was a new normal for global temperatures, what does it mean if 2017, 2018, or 2019 are cooler? In our study we defined the new normal as the point in time when at least half the following 20 years are warmer than 2015’s record breaking global temperatures. We examined extreme temperatures in a number of state-of-the-art climate models from an international scientific initiative. We also explored how different future greenhouse gas emissions impact temperatures. We used four different greenhouse gas scenarios, known as Representative Concentration Pathways, or RCPs. These range from a business-as-usual situation (RCP8.5) to a major cut to emissions (RCP2.6). It is worth emphasising that real-world emissions are tracking above those covered by these hypothetical storylines. Future extremes: Our findings were straightforward. 2015’s record-breaking temperatures will be the new normal between 2020 and 2030 according to most of the climate models we analysed. We expect within a decade or so that 2015’s record temperatures will likely be average or cooler than average. 14 December 2016, MET UK: Explore their interactive animation of monthly global surface temperatures from 1850 to 2016, and some of the key events that have influenced this 166-year-long record. This interactive animation is a collaboration between the Met Office Informatics Lab and the Met Office Hadley Centre. NOTE: Click on graphic to access animation, when open click and hold on globe to view different parts of the globe. Scientists find common ground over climate sensitivity. 23 June 2016, Washington Post: Here at the Energy and Environment blog, we cover, regularly, the tipping points of climate change — how, for instance, the glaciers of West Antarctica may already have passed a key threshold that leads to unstoppable melt. We cover the history of the Earth’s climate — including why the Holocene era, which began some 11,700 years ago and we lived in up until fairly recently (when many researchers believe an “Anthropocene” began), was so stable and conducive to human civilization. And of course we cover the quest to keep warming below the Paris climate targets, 1.5 degrees and 2 degrees Celsius, and the scenarios for greenhouse gas emissions that might be capable of doing that — and also those that can’t. [The math the planet relies on isn’t adding up right now] But these are all complicated, nuanced stories, and the idea that they can all be pulled together into one analysis — much less one figure — is hard to believe. Nonetheless, I think three researchers from the Potsdam Institute for Climate Impact Research have done precisely that with the image below, which is part of an optimistic essay they just published in Nature Climate Change, suggesting that the recently negotiated Paris climate agreement has what it takes to stabilize climate change. In the process, the researchers deliver the sort of rare big picture analysis that we mortals need now and again to understand why scientists are generally so freaked about a warming climate, and also why, in this case, they’re feeling a shard of hope. Yet another way to visualise temperature rise – How many do we need? The animated spiral presents global temperature change in a visually appealing and straightforward way. The pace of change is immediately obvious, especially over the past few decades. 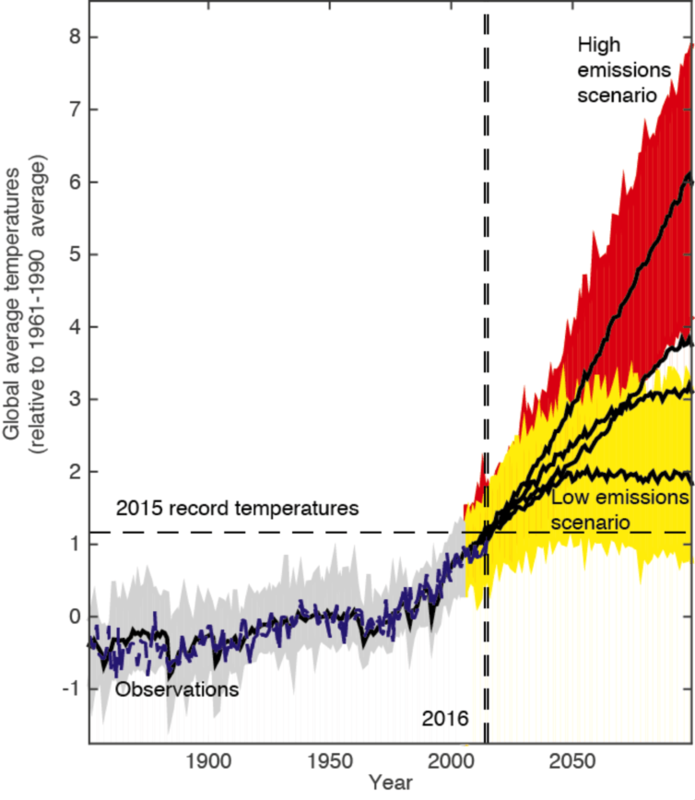 The relationship between current global temperatures and the internationally discussed target limits are also clear without much complex interpretation needed. Click on graphic to go to animated spiral. CO2 increasing but why do the levels go up and down? 15 May 2015, Climate Central: The reason that CO2 is building up to higher levels each year is related to the seasonal cycle. While plants take up CO2 as they awaken after their winter hibernation, and then release it again as they go dormant again in the fall, they can only sop up so much in a given season, leaving behind an ever-growing excess amount. Why are nights heating up faster than days? 10 March 2016, Bjerknes Centre, Observations from the last fifty years have shown that the nights have been warming much faster than the days. Analysis of the causes of this more rapid warming at night shows that this is likely to continue in the coming decades. 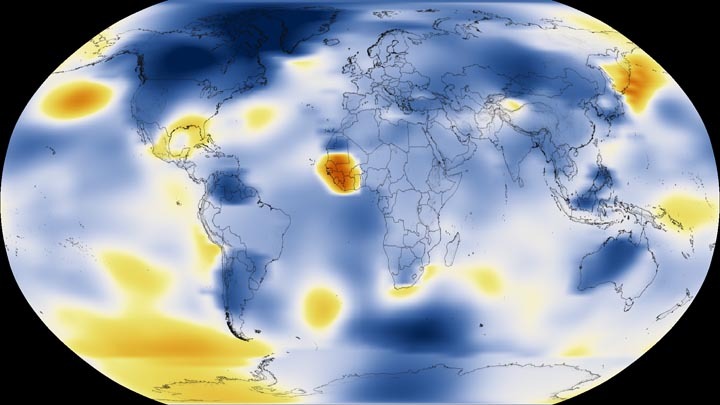 A new publication led by Richard Davy, researcher at the Nansen Centre and the Bjerknes Centre has examined the causes of the more rapid warming at night compared to the day, which has been seen around the globe in recent decades. They have analysed the causes of these changes from observations and model reconstructions of the climate in the 20th century. By using model reconstructions they were able to determine how much of this asymmetrical warming could be explained by different processes. Past efforts to understand the reason for this enhanced warming have focused on changes to climate processes that may have occurred at this time, such as increases in cloud cover, precipitation or soil moisture content. However, Davy and colleagues have shown that part of this more rapid warming at night is innate to the climate system, because the night-time temperatures are inherently more sensitive to climate forcing. IMAGE: THE INCREASE IN REGIONAL AVERAGE TEMPERATURES AROUND THE WORLD WHEN GLOBAL AVERAGE TEMPERATURES REACH 2°C ABOVE PRE-INDUSTRIAL LEVELS. view more CREDIT: (FROM AUTHORS’ NATURE PAPER, ALLOWABLE CO2 EMISSIONS BASED ON REGIONAL AND IMPACT-RELATED CLIMATE TARGETS). 12 June 2015, NASA RELEASE: NASA has put a new item up on Amazon. But there’s no price tag and you won’t necessarily find it by using the marketplace’s search bar or browsing the electronics section. Instead, you’ll have to look at Amazon’s cloud, where NASA scientists have shared 11 terabytes of high resolution climate projections. A snapshot of July in 2100 in the map below shows how detailed the projections are (global high temperatures in July 2100 under high greenhouse emissions). The new dataset is available to anyone with an internet connection, but comes courtesy of supercomputers only available to NASA scientists and a lucky handful of grantees. If you want to access the data set go here. Where did the “97%” of climate scientist agree with man-made global warming” come from? Two Degrees “safe limit” and why did they pick it? And is this a sensible way to decide what is “safe”? 15 June 2015, The Carbon Brief an In-depth analysis: Is the 1.5C global warming goal politically possible? For the past five years, international climate change negotiations have been guided by the principle that the rise in global average temperatures should be limited to “below 2C above pre-industrial levels”. Is this goal adequate? Probably not, according to a report conducted by the UN and launched at the climate change negotiations in Bonn. Containing the views of 70 scientists gathered together in a process called the ” structured expert dialogue” (SED), the report warns that even current levels of global warming – around 0.85C – are already intolerable in some parts of the world. It says: “Some experts warned that current levels of warming are already causing impacts beyond the current adaptive capacity of many people, and that there would be significant residual impacts even with 1.5C of warming (e.g. for sub-Saharan farmers), emphasising that reducing the limit to 1.5C would be nonetheless preferable.” This report provides the evidence base for discussions at UN level over whether the world is being ambitious enough on long-term action to tackle climate change. The main finding of the SED report is that the 2°C limit is indeed too warm for many vulnerable systems and regions, and a 1.5°C limit would be significantly safer. In addition, the SED advises that 2°C should not be seen as a guardrail, but rather a defence line, that should not be crossed. And if we want to be sure not to cross it, we should actually aim for a 1.5°C limit. And perhaps one of the most important implications in the short term of the SED findings is its advice to “avoid embarking on a pathway that unnecessarily excludes a warming limit below 2 °C.” These results confirm the views of the most vulnerable groups, like the SIDS and LDCs, who have pushed for a 1.5°C limit since the Copenhagen meeting. The report underscores the scientific legitimacy and significance of their case. It is now important that these findings make their way into the negotiations on the new global agreement now underway and scheduled to conclude in Paris in December 2015. You can read Climate Analytics’ briefing on the main points covered by the SED here. Climate talks in Bonn: While the message of the report is clear, it does not close the current chasm between climate science and policy. At UN climate negotiations in Bonn last week, the report and its findings were subject to intense scrutiny and discussion by diplomats from around the world. It is these policymakers – not the scientists – who get the final say on whether the findings become the new basis for future political decisions, embedded in a new international climate deal set to be signed at the end of this year in Paris. 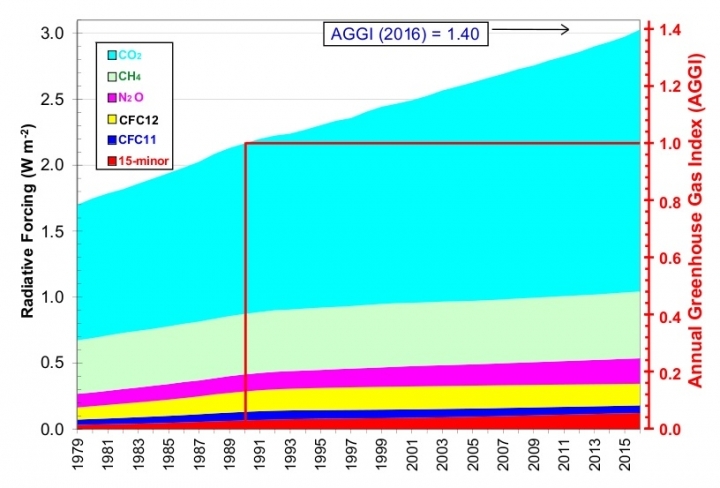 27 May 2015, The Conversation, A matter of degrees: why 2C warming is officially unsafe: The goal of international climate negotiations is “to avoid dangerous atmospheric concentrations of greenhouse gases”. In 2010, Parties to the United Nations Framework Convention on Climate Change formally recognised the “long term goal” of the convention was to hold the increase in global average warming to below 2C above pre-industrial levels. Is 2C therefore the safe limit above which climate change becomes “dangerous”? A UN expert dialogue of more than 70 scientists, experts, and climate negotiators recently released a final report concluding that 2C is “inadequate” as a safe limit. Read More here. View the full UN Report here. If you want just the basics scroll through to the message boxes. Figure 2.6 below shows estimates of the time it takes for different parts of the climate system to respond to a situation where emissions are reduced to equal the rate of natural removal. While greenhouse gas concentrations stabilise in around a hundred years, the temperature and sea-level rise due to thermal expansion of the oceans takes much longer to stabilise. The melting of ice sheets is still increasing the sea level even after a thousand years. Source: IPCC (2001b: Figure 5.2), reformatted for this publication. Another way of looking at how temp increases – by trend or steps?? WHY IT IS IMPORTANT: Step changes in warming of a few tenths to 1°C can produce rapid changes in risks such as extreme heat and fire danger. Yet, adaptation-planning that follows the dominant model of smooth climate change makes gradual adjustments to keep up with small changes in extremes. In these circumstances, a rapid change can catch sensitive systems out. Poorly planned responses may also lead to maladaptation. CONCLUSION EXTRACT: Climate conceptualised as a mechanistic system and described using classical statistical methods is substantially different from climate conceptualised as a complex system.With record atmospheric and surface ocean temperatures in 2015/16 variously being described as a singular event, a reinvigoration of trend-like warming or a wholesale shift to a new climate regime, this issue is too important to be left unresolved. There are two schools of thought about how the climate changes under increasing greenhouse gases. One school considers that the forced component and internal variability are independent, with externally-forced atmospheric warming being gradual, surrounded by the uncertainty of (nonlinear) climate variability. The other school of thought considers that added warming enhances climate variability, which, over decadal time scales, is fundamentally nonlinear. These nonlinearities are associated with step-like changes in steady state climate regimes. Under increased forcing, the nonlinear behaviour associated with climate variability would be enhanced, leading to more frequent regime changes. These would likely manifest on regional scales, even though, under sustained forcing, global warming is expected to follow a complex trend.